This amble includes some magnificent beach walking along the sands in front of the Holkham National Nature Reserve. Acres upon acres of golden sand when the tide is out with big skies and thousands upon thousands of razor shells which are washed up on the high tide mark. 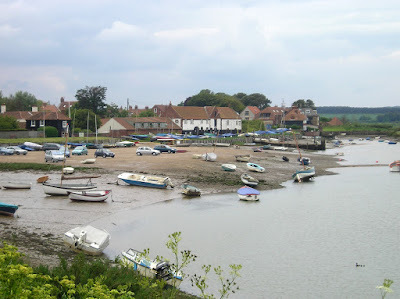 The walk ends at Burnham Overy Staithe, the quiet hamlet which is said to be where Nelson learnt to row and sail. Brisk westerly wind, overcast to start with showers later. The intention on this walk was to follow the North Norfolk Coast Path from Wells, through Burnham Overy Staithe and continue onto Brancaster calling in at the Jolly Sailors pub, home of the Brancaster brewing Company. This started well, even though the skies were grey and there was a keen south westerly breeze against us. The beach walk is a worthy highlight of this section and the high tide mark is covered with thousands upon thousands of razor shells. They crunch and crackle under the feet and present some good photographic opportunities. The sand stretches for miles and despite the weather not being at its best there was still a good few people braving the elements on the sands. The weather changed as we headed across the dunes and then followed the exposed defences alongside Overy Creek. The grey clouds had become greyer and a fine rain started to be carried on the brisk breezes making it unpleasant walking atop the embankment. It wasn't heavy rain but that fine drizzly stuff that seems to get into any opening in ones waterproofs, especially with the wind making it blast in at an almost horizontal angle. I am not averse to the weather whatever it may throw in ones direction and have experienced the worse of weathers during the numerous expeditions I have undertaken throughout the years. But, on this particular day, on a section of the Coast Path that both of us had traversed on many previous occasions and without any need or expectation to complete the entire distance we had originally planned, the thought of continuing was up for debate. Therefore, on reaching Burnham Overy Staithe and feeling decidedly damp, and after inspecting the dark grey skies which threatened more heavier persistent rain, and with the knowledge that it was another 3 miles out on the exposed marshes to Burnham Deepdale, the decision was taken to curtail the walk for the day. No sense of failure. The walk is what it is and sometimes it makes sense to call it a day. The beauty of the North Norfolk Coast path is that it is always close to the coast road where the half hourly Coasthopper bus service provides the vital links between start and end points for a days walk along this picturesque coastline. As such, it means one can pick, choose and change ones plans without much forethought or planning. I can't think of another National Trail that offers such a well serviced route, which makes it an ideal long distance path for anyone who is considering undertaking such a feat for the first time. Given a weeks holiday and a central base, with the assistance of the Coasthopper service, the would-be walker can complete the entire length of the North Norfolk Coast Path no matter what their ability or age without the need for heavy rucksacks, strict itinerary or enormous amount of effort or stamina - one can do it at ones own pace in however many sections as one cares to undertake. You don't have to even be a keen walker. You can do a little walking to coincide with a pub visit, or even undertake a glorious North Norfolk pub crawl. And the Coasthopper buses do have the slogan 'birdwatching sealspotting daytripping alesupping' emblazoned along the top of their livery which is almost an encouraging invitation for any ale enthusiast to board in order to sample the delights of Norfolk's many and varied ales. And with a one day pass one can board and alight as many times as one likes. Walking. Ale supping. Heaven! As stated previously, one of the intentions of the days walk was to visit the Jolly Sailors pub at Brancaster Staithe and despite Burnham Overy Staithe having its own pub, adjacent to the bus stop, the call of sampling a pint of Jolly Sailors own locally brewed ale was too much of a temptation. I have nothing against The Hero pub, it is friendly enough and they serve Woodfordes ales but it has been modernized with a minimalist décor and in my humble opinion that does not make a traditional pub. I much prefer an old pub full of curios and nooks and crannies that are an enticement for exploration and investigation. ~Maybe another time for The Hero but the Jolly Sailors was the pub for me even though it entailed a short bus ride. It was well worth it. For those who do continue along the coast path then it is easy to reach as the Coast Path passes just behind the houses of Brancater Staithe with a path that leads from the boatyard at the Staithe and emerges opposite the pub. The path is simple and easy to follow, with the distinctive acorn National Trail waymarkers pointing out the route. Continue out of Burnham Overy Staithe along the road until the path heads back onto the marshes. Follow this through to Burnham Deepdale. Continue along the path behind the back of the houses until it meets a Staithe marked with fishing huts and lobster pots. A track here leads up to the road where the Jolly Sailors pub is located opposite. A traditional 18th century freehouse and home to the Brancaster Brewery which is housed on site. It is said that brewing at Brancaster Staithe dates back to Roman times and in 1797 the hamlet hosted the country's largest malthouse just yards from the pub which was reputedly constructed from stone taken from the Roman fort at Branodunum. The present brewery is a five barrel plant that produces a selection of ales although not all are available at any one time. The rustic pub offers home cooked food, stone baked pizzas to eat in or take-away and local seafood. There is ample room outside in the gardens with a dedicated kids play area. The pub advertises that children, muddy boots and dogs are welcome. Although not specifically on this walk, it is only a short bus journey away. Its always a treat to visit this pub. It is everything one expects from a traditional old English pub. Oyster Catcher was the beer of choice, brewed on the premises and a golden and refreshing ale which was a delicious accompaniment to a hearty bowl of soup and crusty bread. There is something about a beer from a small brewery that makes it so much more satisfying than that from larger breweries. It is like the difference between a mass-produced loaf and that of a locally baked piece of bread that needs to be eaten fresh and warm. Oyster Catcher is distinctive and full of flavour and hard to pull oneself away from another once ones glass is empty. A fascinating pub. Excellent beer. Great food. What else could one ask for? In front of the car park adjacent to the pub was a black 'A' board on which was chalked in large letters 'Brancaster Staithe Fresh Mussels' under which it stated 'Harvested' with an arrow pointing to the Staithe and under that 'cooked' and an arrow pointing to the pub. Clever but true and we did contemplate the mussels - they too would have went down well with the Oyster Catcher ale. Another time! The pub certainly dates from at least the mid 19th century when it was possibly known as the Anchorage although it did not obtain a full licence until 1929. The pub was extensively refurbished in 2005 to create an open plan and modern minimalist appearance. The pub was then taken over in 2016 by the proprietor of the Anchor at Morston. The primary focus of this in is on dining with accommodation. Ales are supplied by Woodfordes and Adnams with local guest beers. Burnham Overy, sometimes spelt Overey in older publications, consists of two settlements, Burnham Overy Staithe which is the creek-side hamlet that the North Norfolk Coast Path passes through, and the original village of Burnham Overy Town located a mile south where the parish church is sited. The curious name of Burnham Overy derives from Old English where Burnham is a homestead on a stream and Overy means 'across the river', therefore this is literally the Burnham on the other side of the River Burn. Staithe is also from Old English meaning 'a landing place' and is a common name found throughout much of Norfolk. During the middle-ages Burnham Overy was the port to the six villages that make up the Burnhams. In those times merchant ships were able to navigate up the River Burn to Burnham Overy Town where a thriving trade in corn and coal, together with the renowned oysters farmed in the local beds, bought wealth and opportunity to the local community. With the passing of time the river silted up and the trade had to be moved downstream to the Staithe. Commercial use of the Staithe ended soon after the First World War when the railways had taken over as the preferred method to ship cargo. Today the harbour at the Staithe is used as a sailing centre and as a departure point for trips out to the Scolt Head Island National Nature Reserve.